One thing that has surprised me about teaching is what an emotional roller coaster it can be. One day I feel like a superhero teacher who rocked every lesson and was on top of her game; the next day I feel as if I have no idea what I’m doing and nothing went right. The remarkable thing about teachers, though, is their resilience. Even after a horrible day, they come back the next morning ready to try again. It’s no wonder that teaching is a profession that requires utmost passion; some days that is all we are running on in order to come back and fight another day even after we feel we are down for the count. An unflinching sense of optimism is also a handy tool to have. Tomorrow is thought of as a chance to do better, be better. It is a new opportunity, a blank slate, a great day just waiting to happen. -take some time for yourself to do something you enjoy; self care! -get a good sleep so you can come back the next day refreshed and ready to rock it! On that note, time for me to go to bed early and be ready to rock it tomorrow! What are your tips for when you’ve had a bad day? What keeps your passion fueled to continue to do your job, despite its challenges? As a very passionate and proud Pre-K teacher, I do not have any trouble finding happiness, joy, and fun in my job and in the learning journey I share with my “littles.” However, in a small town school, we only have one class of Pre-K (in the morning), which leaves the afternoon part of my job: teaching classes in other elementary grades so that their homeroom teachers can have their prep time. I take pride in the fact that I am giving other teachers precious prep time, but I have to be honest in saying that I don’t find the same amount of joy and happiness in this aspect of my job (which, as one of those “born-to-be-a-teacher” types, bothers me). Next year, I have Grades 4, 5, 6, and Kindergarten on my plate, which altogether will be about 130 students who I see for just a small portion of their week. The most difficult part of this, for me, is not having enough time together to form relationships with each student. As an optimist through-and-through, I don’t want to go into the year feeling flat during my afternoons (who wants to feel drained and without passion?). So I am aiming to think of small ways to develop relationships with my prep students and build in more of those golden teaching moments where you can truly enjoy the students. Darting from classroom to classroom definitely makes this a challenge, and the limited amount of time I have with each class isn’t ideal, either, but I am determined to bring some happiness, joy, and fun into these classes (for both myself any my students). I hope to save 10 or 15 minutes each week to have sharing time, so that we can discuss important or exciting things going on in our lives as a learning community. I truly believe that investing some of my instruction time into getting to know the students will serve me in the long run! After all, classroom management has to begin with respect and relationships. Do you have any quick/easy ways of building relationships with students that you could share? I would love to hear your suggestions! Here I sit, underneath the covers of my bed (where I had planned to veg out all evening). However, after a text from a colleague asking for some technological Twitter help, I got sucked into the Twitterverse and my dormant teacher brain quickly booted up again. A staff member at my school had a question about using our new school hashtag (which you should check out at #HBCSpride). I quickly checked Twitter to investigate the problem. After finding the solution to the problem, I replied to my colleague’s query. However, this was only the beginning of my foray with Twitter for the night. While I love Twitter as a way to connect with other educators, I am still working on finding time to actually scroll through it. Since I was already on the app, I decided to sift through some of the latest tweets in my main feed, on #HBCSpride and #saskedchat. I had previously been toying with the idea of moderating a summer Twitter chat (thanks to a gentle suggestion from @kwhobbes) and came across the sign up sheet. Labor 1: Find the heinously complicated password STF set up for me in the fall written on a note (You know the ones that are a random mixture of upper and lowercase letters, numbers, and symbols that you don’t even know how to find on your keyboard? Yeah. It was one of those). Labor 2: Correctly type in the heinously complicated password STF set up for me. Labor 3: Realize that the heinously complicated password STF set up for me is only a temporary password and now I must come up with my own heinously complicated password. Changing a password isn’t a pre-requisite skill to blog, right? Now, I apologize to those of you who are following the Blogging Exposé, because you’re probably wondering, “At what point in this post does she actually address this week’s topic?” (which is Summer Reads, by the way). Well, you’ve made it, to this completely underwhelming blip on the radar that is the actual topic of this week’s Blogging Exposé. 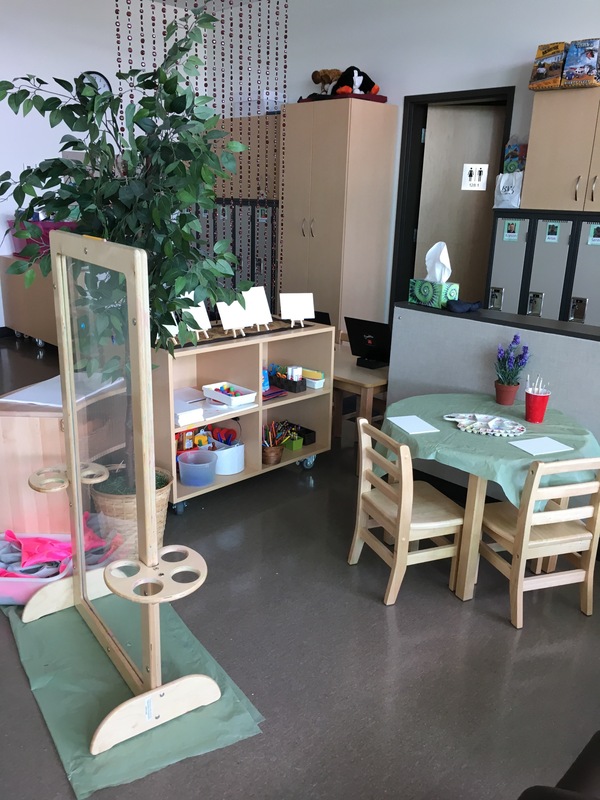 Long story short, one of our division’s Coordinators of Learning (and also head of the ECE programs in the division – check her out here) very kindly lent me an entire stack of resources focused on early learning, the project approach, inquiry, Reggio Emilia, etc. to peruse for the summer. I apologize, because I have left all of them at my summer home (not my school year home) and can’t name them all for you now. But I will try my very best to give you some updates when I get around to reading them (amidst all of the other teacher-geared activities I have managed to plan for myself in one night – haha! Don’t worry though, I pencilled in plenty of time for relaxing, recharging, and recuperating as well.). Stay tuned to continue to follow me on my journey as a teacher in the summer months. TL;DR – Even when I plan to take a night off, I don’t. I have some exciting PD opportunities coming up this summer. There are few things I enjoy more than rearranging my classroom furniture and centres/invitations. It makes things feel fresh and exciting. Plus I love watching my students react to new materials I have set out. Check out my new setup! My natural materials area! Filled with real birds’ nests and real grass for the frogs to frolic in. 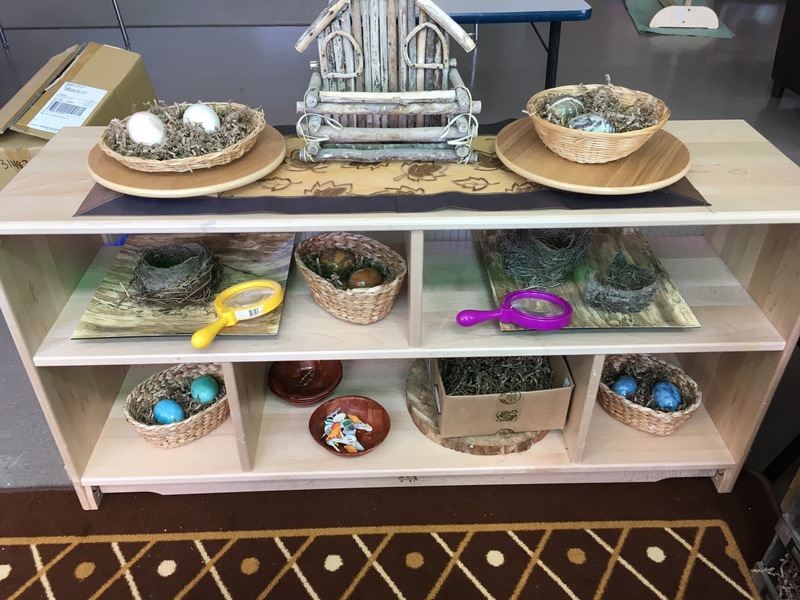 We are going to be learning about birds, nests, and eggs in the coming weeks. Art studio area, complete with many new supplies the students haven’t seen before. I think they’ll LOVE the mini canvases. I’m excited to display their artwork on the easels. 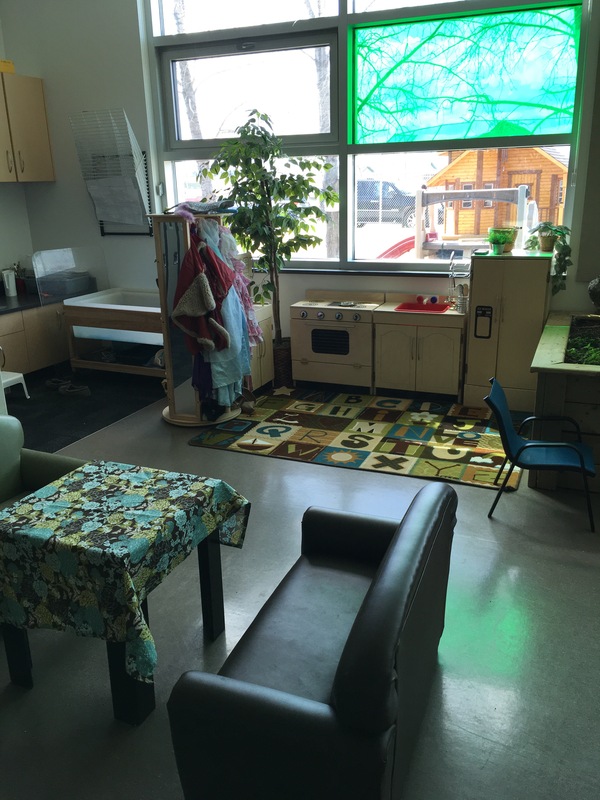 Dramatic play/kitchen area. 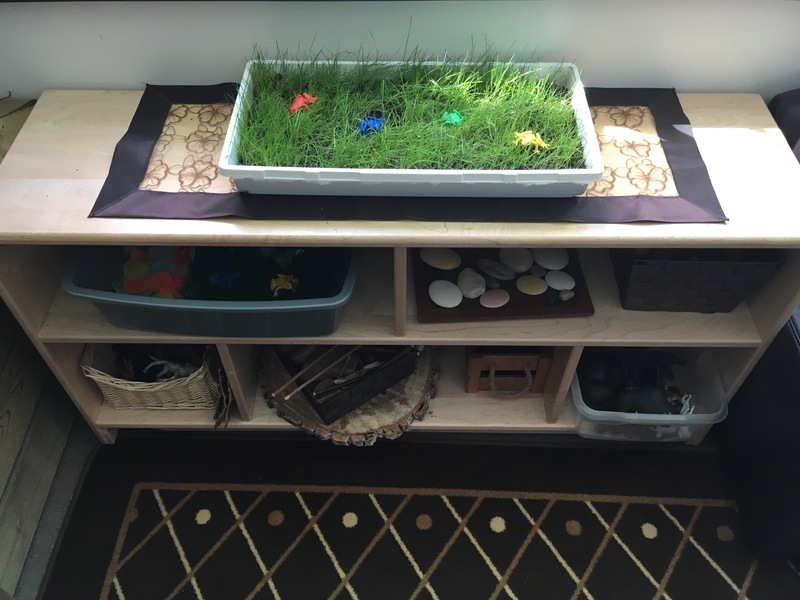 To the left of the photo is the large sensory table, which currently has water beads in it. 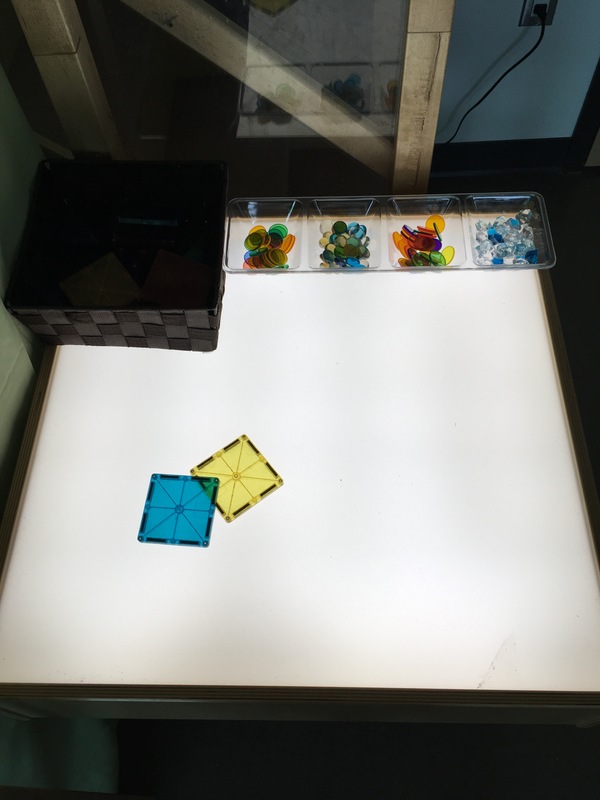 Our brand new light table is going to be a hit, I can already tell! I have quite a few different translucent materials to explore. 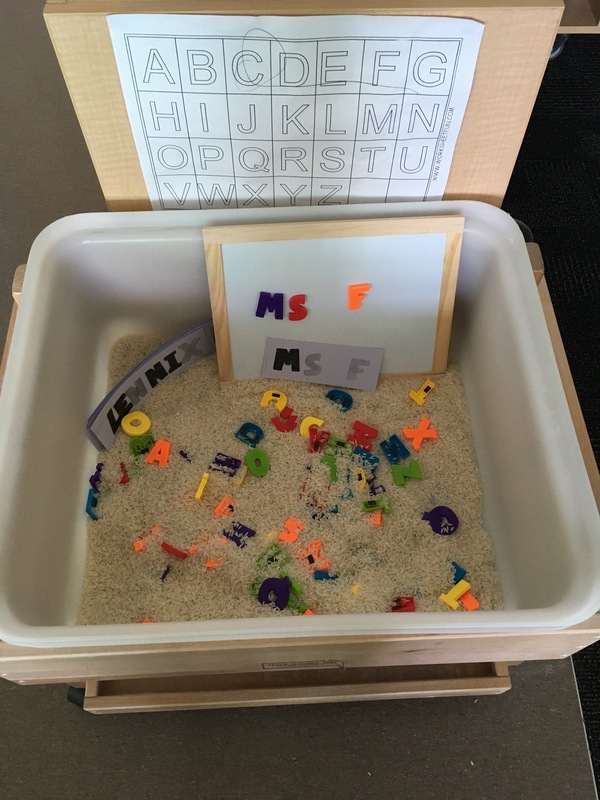 My small sensory bin is featuring rice, magnetic letters, copies of the students’ names, and a magnetic board. I hope they’ll enjoy this letter hunt invitation. 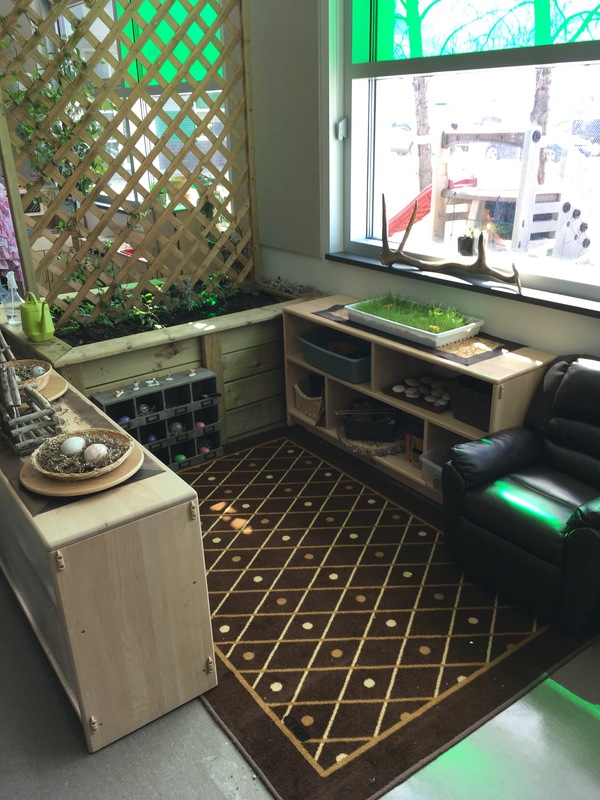 We are also EXTREMELY lucky to be getting an abundance of new equipment, toys, and furniture for our outdoor playground that you can see right out of the classroom window. I will post pictures and an update once all of it is installed. 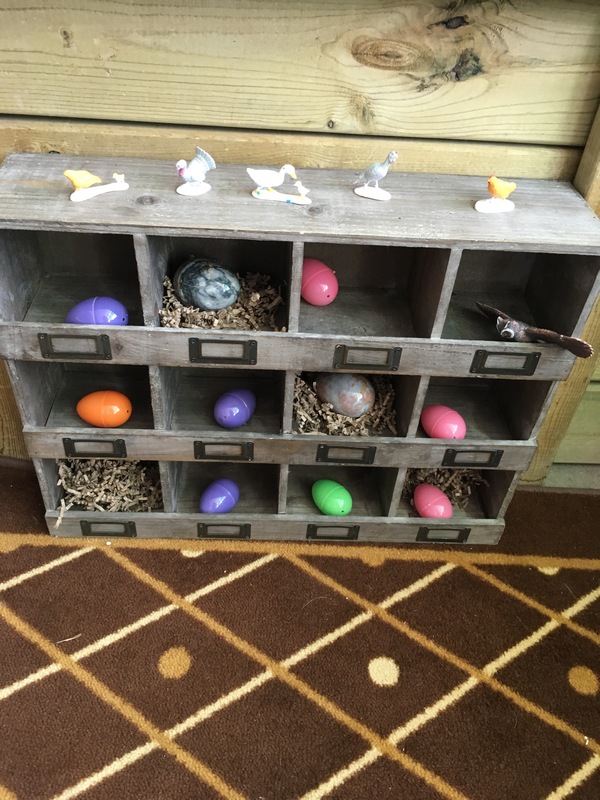 We at HBCS Pre-K are sure spoiled and blessed with all of the amazing learning materials we have at our fingertips.